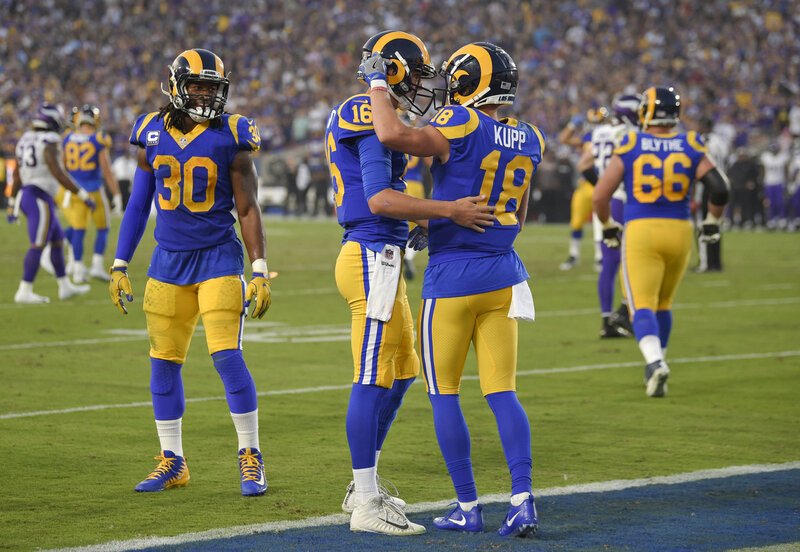 On Thursday night, the Los Angeles Rams took on the Minnesota Vikings in L.A. and it certainly didn’t disappoint. Personally, I saw these teams as the two best in the entire league. A possible NFC Championship preview. It was surprising to see this matchup as a Thursday night game rather than primetime Sunday night. Either way, we were able to witness the best battle it out to see who is currently the better team. The home team rose to the challenge. I’m going to be honest, at first I wasn’t exactly sure who to pick in this game. The main factors I looked at for both teams were the defenses. Little did I know, both defenses weren’t going to play all that well. I’ll give the Rams a slight pass due to Aqib Talib being out. Having one of your pro bowl CB’s out is bound to cause you some trouble. Even then, I still thought they had enough defensive talent to not let Kirk Cousins do what he did to them. The Vikings QB torched L.A.’s defense for 422 yards and 3 TD’s on 36/50 passing but was somehow still in the shadow of Jared Goff. The Rams stud put up 465 yards and 5 TD’s on 26/33 passing. Near perfection. There were a total of FIVE receivers with 100+ receiving yards in this game. It was an offensive explosion, to say the least. The run game for both sides didn’t have too much success but Gurley put up a strong 83 yards. As for the defensive side, The Rams stout defensive line remained dominant against an already struggling Minnesota offensive line. Overall, it was a solid game and there’s no doubt the better team came out on top. Through four games, the Rams have looked scary good. Sure, the defense had a rough night this week but it didn’t stop them from beating the second best team in the NFL did it? That’s the biggest perk about this Rams team that makes them so great. If the defense has a rough night, Jared Goff and the rest of the L.A. offense has so many weapons and so many playmakers to the point where they can put up over 40 points on you if need be. If the offense is struggling, they have one of the best defensive lines in the league and arguably the NFL’s best CB duo to lock down any opposing offense. The Rams are not just an extremely well-balanced team but they are terrifyingly good on both sides. Honestly, the Vikings held their own pretty well for what they went up against. Plain and simple, this Rams squad is no fluke and expect to see that “W” next to their name quite a bit more times as the season continues.